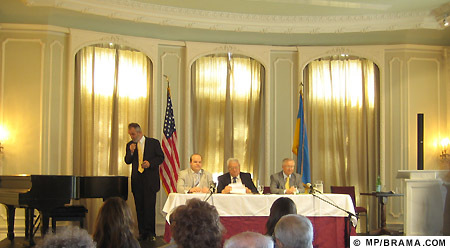 On Sunday, June 20, 2010 at the Ukrainian Institute of America in New York City, three leading members of Ukraine's political opposition held a town hall meeting with the area's Ukrainian-American diaspora. 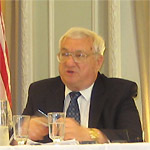 Borys Tarasyuk, former foreign minister of Ukraine, Yuriy Scherbak, former ambassador to the U.S. and Canada, and Valeriy Chaly, former deputy minister of foreign affairs of Ukraine, gave presentations and discussed issues with the audience for over two hours. Notably, when asked about Viktor Yushchenko, Mr. Tarasyuk presented a detailed and extensive criticism of the ex-president, expressing not only considerable disappointment but dismay at the lost time and opportunities squandered by the previous administration. Despite the summer's heat, the audience listened attentively and participated enthusiastically when they had opportunities to ask questions. 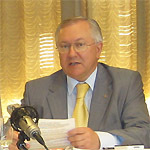 The event was organized by Center for US-Ukrainian Relations (CUSUR); introductions were made by Walter Zaryckyj, NYC Bureau Chief of CUSUR. 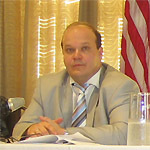 The three individuals were in the United States meeting with Ukrainian-American communities in New Jersey, Pennsylvania, and Ohio, as well as holding high level discussions with members of the Barack Obama administration and the U.S. Congress.